Problems with your vehicle’s battery can be very frustrating, which is why it pays to talk to your mobile mechanic in Brisbane. We know everything there is to know about batteries, meaning that we can test your battery, charge it, select the right one for your needs, fit it and even take the old battery away for recycling. Testing your battery: If you are having problems with your battery, we can perform a test that will tell us whether you need to replace the battery now or in a few months’ time. Essentially, we check the battery’s current performance against its expected performance, which will let us know whether it needs to be replaced or not. Charging your battery: If your battery needs to be recharged, it’s best to call your local mobile mechanic in Brisbane, because jump leads and a quick drive around the block won’t help your battery to fully recharge; it will quickly go flat again! This is because modern alternators are designed to maintain a healthy battery, not try to keep a bad battery going. We can make sure that your battery is fully charged and that it’s healthy, ensuring that you don’t have the same trouble again. 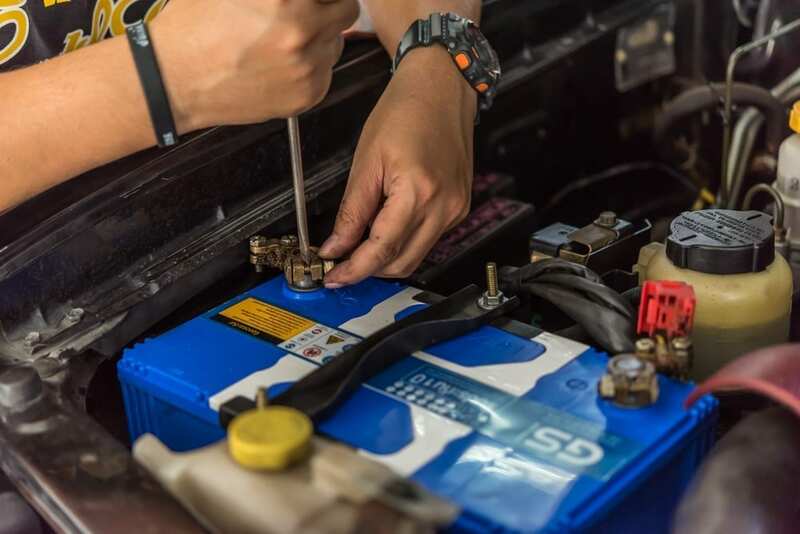 Selecting the right battery: Different vehicles need different types of batteries, so if you aren’t sure which type of battery you need for your car, just ask your trusty mobile mechanic in Brisbane and we will sort you out, double quick. Fitting your new battery: Have you ever removed your car’s battery and lost all your radio stations? Well along with losing your saved radio stations, your computer can also lose stored data when you remove your car’s battery. To avoid this problem, your mobile mechanic in Brisbane uses a ‘memory saver’ to ensure that this problem doesn’t happen to you. Recycling your old battery: You can’t throw old car batteries in your waste or your recycling bin, as its contents contain acid and are toxic. We will take these old batteries away and recycle them safely for you. For services, repairs or battery problems, call Premium Mechanical Services – the leading mobile mechanic in Brisbane – on 0422 156 277 or send us an email.